Canada's women's rugby sevens team is thrilled to be taking part in their event's Commonwealth Games debut, but just being there isn't enough. They came to Australia to win gold. GOLD COAST, Australia — For Canadian women's rugby sevens veteran Ghislaine Landry, it's nice to finally be here. But that's not enough. 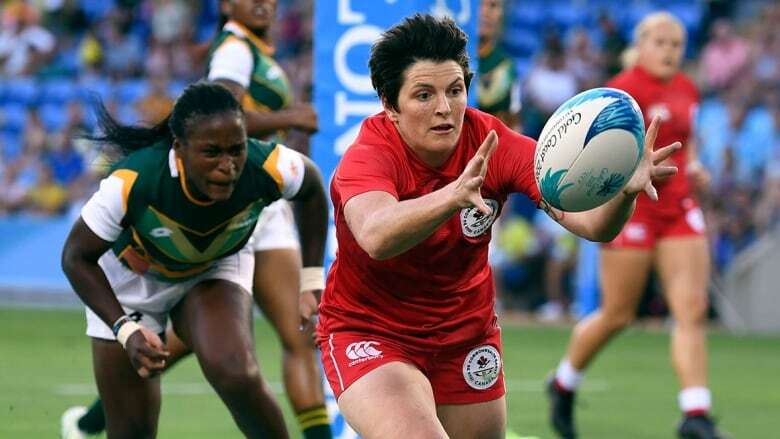 The all-time leading scorer in women's Sevens World Series history got her first chance to compete at the Commonwealth Games on Friday after a women's tournament was added to the programme for the first time. The move was part of the Games' goal of improving gender equality. "We're happy to be here and having the first women's rugby tournament here," Landry said. "We're always looking to improve the women's game back home and around the world and for this to be part of that is really important." While it's nice just to be included, Landry is blunt about what she and her teammates want here — to become the first-ever Commonwealth Games champions in their event. "The goal is to win," she said. "We know we're capable of it. We've been putting in so much work. We've beat every team here. It's just a matter of putting in a complete tournament. The belief is there. We just have to go out and do it." 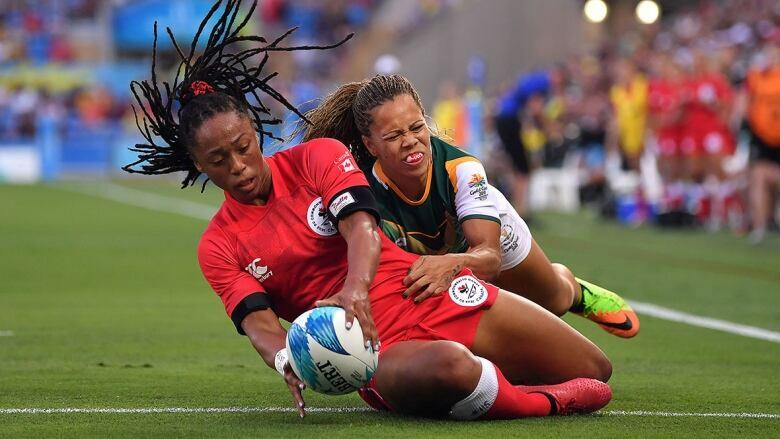 The 29-year-old captain from Toronto and her squad started off on the right foot at Robina Stadium, taking a 29-0 win over South Africa in the very first women's sevens game contested at a Commonwealth Games. They followed that up with a 24-12 decision over Kenya, in which coach John Tait said the normally staunch Canadian defence showed it had some studying to do ahead of its clash with world No. 2 New Zealand on Saturday. New Zealand is also 2-0, so the winner of that game will finish atop Pool A. The top two teams in each of the two pools advance to the semifinals. "We had a couple little lapses," Tait said. "New Zealand, they're pretty clinical when you give them any time and space. We'll be looking at the video tonight and come up with a plan to come out and hopefully top the pool." The Canadian team's goals here in Australia go beyond the group stage and the medal round. The roster is a seasoned one — only four players were not part of the team that scored Olympic bronze in Rio two years ago — but the squad is always looking to gain experience. This is just the third major multi-sport Games appearance for the Canadian women's team, and the Commonwealth Games are an important stepping stone toward the Tokyo 2020 Olympics. "Once you're at this stadium it's pretty much like any other tournament," Landry said. "But being part of Team Canada, being at the village with all the other athletes, it's a really good experience. "A few of us learned it at Pan Ams, to prep for Rio, but it's just another opportunity and the young girls are taking it in and they're just going to be that much more prepared for 2020." Victoria native Caroline Crossley is one of a few players experiencing her first multi-sport Games and will also be the answer to this trivia question coming to a pub near you: Name the first player to score a try in Commonwealth Games women's sevens history. "It's super special," the 19-year-old said of her place in the record book. "It's just awesome that this sport is in the Commonwealth Games now so I feel super honoured to have that [record], but it was a team try. Everyone has a part in it." Crossley, who made her Sevens Series debut in 2016 in Dubai, is a "player of the future," according to Tait. "She's got all the tools," the coach said. "It's just a matter of confidence for her and when she develops it and starts to back herself, like she did today, she's gonna be a real handful for anybody. "I'm really happy she got [the first try] because with a little confidence she has the potential to be one of the best in the world." Helping Crossley build that confidence and acclimatize to this new environment is her captain. 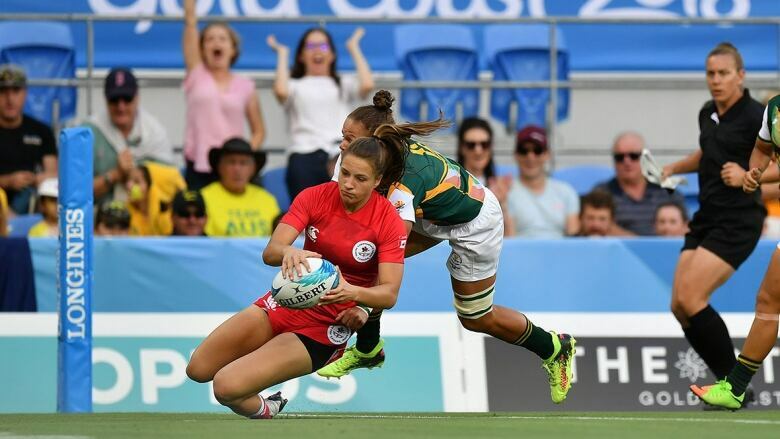 Landry, a nominee for Sevens World Series player of the year in 2017, is counted on by Tait to be a calming force for her team. "Ghislaine is a great leader for the girls on and off the field," he said. "She leads, first and foremost, by example. She has the total respect of her peers. She has the astute awareness of how to communicate with each and every one of them and that's what makes her such a special leader and player." The challenge directly in front of the Canadians is a date with the Black Ferns in their final pool game. Among the Kiwi players they'll face is the woman who beat out Landry for player of the year honours, Michaela Blyde. "We love playing [New Zealand]. They're one of the best teams in the world," Landry said. "We're looking to beat them and we're looking to be the best team here." The gold- and bronze-medal matches will be contested on Sunday, the final day of competition at the Gold Coast Games.